The idea of a Chinese casserole is to combine a variety of ingredients, cooking them together such that the flavors can mingle together. The key to making a good casserole is the control of the amount of liquid and the use of just the right amount of flavorings. The result should be that there is a small amount of liquid left, such that the ingredients do not feel dry. If there is too much liquid, it will feel more like a soup and the flavors will taste washed out. Fried tofu has all the characteristics that makes it easy to be cooked well in a casserole: 1) it can be cooked for a long time without breaking apart 2) it easily absorbs colors and flavors, and 3) its mild flavor blends easily with many different ingredients. 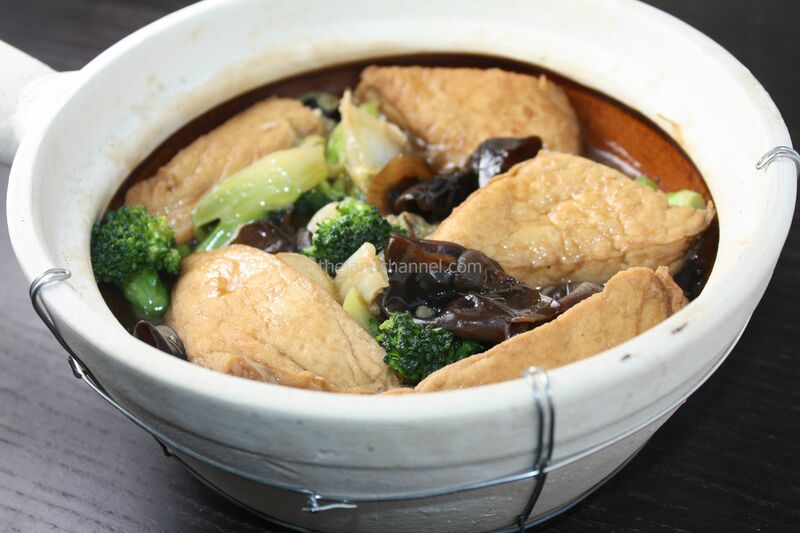 It is no wonder that it is a very common ingredient in Chinese casseroles. Soak wood ear in hot water and let sit for 20 minutes. Clean and remove any hard parts with scissors. Blanch fried tofu in large pot of boiling water for 20 seconds. Drain and set aside. Heat oil in pan. Add ginger and garlic until fragrant. Add in fried tofu and stir fry for 3 minutes. Add oyster sauce, dark soy sauce, soy sauce, and sugar. Add 1 cup of chicken stock. Bring to a boil, and reduce the heat to medium-low. Cover and simmer for 10 minutes. Add cabbage and wood ear, bring back to a boil under high heat, then cook over medium-low heat for 10 minutes. Add broccoli, bring back to a boil under high heat, then cook over medium-low heat for 5 minutes. In a small bowl, mix corn starch with 2 tablespoons of water. Turn off the heat and pour the mixture in the casserole, stir lightly. Transfer everything to a preheated clay pot. Sprinkle sesame oil to serve.